A Canterbury alpine village is one of the region’s carefully guarded weekend holiday secrets, says the property salesperson who has overseen several recent transactions at the locality. Karen Hennessy of PGG Wrightson Real Estate, Christchurch, has sold 30 Castle Hill properties in the past three years. She says the village, which began as a development in 1982, provides yearround outdoor recreation. 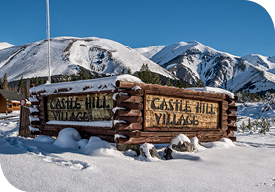 “With four ski fields near the village, Porters, Cheeseman, Broken River and Craigieburn, and the choice of multiple summer outdoor activities, this area has something for everyone and is worth a visit at any time to relax, unwind and enjoy the fabulous vistas,” she said. Located in the Upper Waimakariri Basin 700 metres above sea level between the Torlesse and Craigieburn mountain ranges, approximately 90 kilometres northwest of Christchurch, Castle Hill is named for its distinctive limestone rock formations. Well known by Waitaha and Ngai Tahu, Castle Hill was established as a high country lease in 1858. John Reid, the run-holder in the 1970s, first came up with the alpine village concept. “That 40-year-old vision still holds true with the settlement designated as a special living zone, where rules around specific building materials, in specific colours, are in place to maintain the alpine village character. “Castle Hill’s key attraction is its proximity to Christchurch. We have sold homes to people who travel up after work on Friday and head back to town on Monday morning. Being able to stay connected in your second home is another bonus, thanks to the locality’s excellent cell coverage, which gives people extra flexibility to extend time away from the city,” said Karen. Transactions fall in a range of values. “For the original 1980s homes, prices start around $400,000, ranging through to north of $650,000 in the village’s newer part. We did sell a $650,000 property recently and a few Castle Hill homes would realise more if offered to the market,” she said. Apart from the tracks and climbing routes in the adjacent Craigieburn Forest Park, there are several walks, tramps and climbs in the Korowai/Torlesse Tussocklands Park; the Castle Hill and Flock Hill limestone boulder fields are worldrenowned for climbing; Cave Stream Reserve is a favourite among local cavers; and the area’s numerous high country lakes and rivers offer abundant sport fishing. Karen Hennessy says mountain bikers are also well catered for. “Porters Ski Area recently opened a 1.2 kilometre track beside its alpine lodge, with a backdrop of uninterrupted alpine views, while the 24 kilometre Craigieburn Trail connects Castle Hill Village through to Flock Hill Station and the existing trail network within the Craigieburn Forest and Korowai/Torlesse Tussocklands Parks and there are plans for more Castle Hill Basin mountain-bike tracks,” she said.